Info Pope Benedict XVI is the 265th Pope. Pope Benedict XVI (Latin: Benedictus PP. XVI), born Joseph Alois Ratzinger (born April 16, 1927) is the 265th and reigning Pope, the head of the Roman Catholic Church, and sovereign of Vatican City State. He was elected on April 19, 2005 in a papal conclave, celebrated his Papal Inauguration Mass on April 24, 2005, and took possession of his cathedral, the Basilica of St. John Lateran, on May 7, 2005. Pope Benedict XVI has both German and Vatican citizenship. One of the best-known theologians since the 1960s and a prolific author, he is viewed as a staunch defender of Catholic traditional doctrine and a steadfast advocate of Christian moral values and their importance in the survival of humanity. As a renowned theologian, he is considered to be conservative and a close ally of his predecessor, Pope John Paul II. He served as a professor at various German universities, and was a theological expert at the Second Vatican Council before becoming Archbishop of Munich and Freising and Cardinal. At the time of his election as Pope, he had been Prefect of the Congregation for the Doctrine of the Faith (curial heads lose their positions upon the death of a pope) and was Dean of the College of Cardinals. During his papacy, Benedict XVI has particularly emphasized what he sees as a need for Europe to return to fundamental Christian values, in response to increasing de-Christianisation and secularisation in many developed countries. For this, he has identified relativism's denial of objective truth as the central problem of the faith and has taught about the crucial importance for the Catholic Church and humanity to contemplate God's love, and thus has reaffirmed the urgent "importance of prayer in the face of the activism and the growing secularism of many Christians engaged in charitable work." 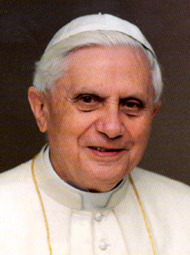 Pope Benedict XVI was elected pope at the age of 78. He is the oldest person to have been elected pope since Clement XII in 1730. He served longer as a cardinal before being elected pope than did any pope since Benedict XIII (elected 1724). He is the ninth German pope, the last being the Dutch-German Adrian VI (1522–1523). The last pope named Benedict was Benedict XV, an Italian who reigned from 1914 to 1922, during World War I. Born in Marktl am Inn, Bavaria, Germany, in 1927 Benedict had a distinguished career as a university theologian before being appointed Archbishop of Munich and Freising by Pope Paul VI, and very shortly afterwards made a cardinal in the consistory of June 27, 1977. He was appointed Prefect of the Congregation for the Doctrine of the Faith by Pope John Paul II in 1981 and was also assigned the honorific title of the cardinal bishop of the suburbicarian diocese of Velletri-Segni on April 5, 1993. In 1998, he became sub-dean of the College of Cardinals and on November 30, 2002, dean, adding also as is custom the title of Cardinal bishop of the suburbicarian diocese of Ostia. He was the first Dean of the College elected pope since Paul IV in 1555 and the first cardinal bishop elected pope since Pius VIII in 1829. Before becoming pope, Cardinal Ratzinger was already one of the most influential men in the Roman Curia, and was a close associate of the late John Paul II. As Dean of the College of Cardinals he presided over the funeral of John Paul II and also over the Mass immediately preceding the 2005 conclave in which he was elected, in which he called on the assembled cardinals to hold fast to the doctrine of the faith. He was the public face of the church in the sede vacante period, although technically he ranked below the camerlengo in administrative authority during that time. Like his predecessor, Benedict XVI maintains the traditional Catholic doctrines on artificial birth control, abortion, and homosexuality while promoting Catholic social teaching. As well as his native German, Benedict speaks fluently Italian, French, English, Spanish and Latin. He can read ancient Greek and biblical Hebrew. He is a member of a large number of academies, such as the French Académie des sciences morales et politiques. He plays the piano and has a preference for Mozart and Beethoven. He is also the first pope to ever own an iPod. Joseph Alois Ratzinger was born on 16 April, Holy Saturday, 1927 at Schulstraße 11, his parents' home in Marktl am Inn, Bavaria. He was baptized the same day. He was the third and youngest child of Joseph Ratzinger, Sr., a police officer, and Maria Ratzinger (née Peintner). Pope Benedict's brother, Georg, a priest and former director of the Regensburger Domspatzen choir, is still alive. His sister, Maria Ratzinger, who never married, managed Cardinal Ratzinger's household until her death in 1991. The pope's relatives agree that his priestly vocation was apparent from boyhood. At the age of five, Ratzinger was in a group of children who welcomed the visiting Cardinal Archbishop of Munich with flowers. Struck by the Cardinal's distinctive costume, he later announced the very same day that he wanted to be a cardinal. Following his fourteenth birthday in 1941, Ratzinger joined the Hitler Youth, membership of which was legally required from December 1936. According to one of Ratzinger's biographers, the National Catholic Reporter correspondent John Allen, he was an unenthusiastic member who refused to attend meetings. In 1943, when he was 16, Ratzinger was drafted with many of his classmates into the Luftwaffenhelfer programme. After his class was released from the Corps in September 1944, Ratzinger was put to work setting up anti-tank defences in the Hungarian border area of Austria in preparation for the expected Red Army offensive. He was eventually drafted into the German army at Munich to receive basic infantry training in the nearby town of Traunstein. His unit served at various posts around the city and was never sent to the front. Ratzinger was briefly interned in an Allied prisoner-of-war camp near Ulm and was repatriated on June 19, 1945. The family was reunited when his brother, Georg, returned after being repatriated from a prisoner-of-war camp in Italy. Following repatriation in 1945, the two brothers entered Saint Michael Seminary in Traunstein, and then studied at the Ducal Georgianum (Herzogliches Georgianum) of the Ludwig-Maximilian University in Munich. They were both ordained on June 29, 1951 by Michael Cardinal von Faulhaber of Munich. Joseph Ratzinger's dissertation (1953) was on Augustine, entitled "The People and the House of God in Augustine's Doctrine of the Church". His Habilitationsschrift (which qualified him for a professorship) was on Bonaventure. It was completed in 1957 and he became a professor of Freising College in 1958. Ratzinger became a professor at the University of Bonn in 1959; his inaugural lecture was on "The God of Faith and the God of Philosophy." In 1963, he moved to the University of Münster, where his inaugural lecture was given in a packed lecture hall, as he was already well known as a theologian. At the Second Vatican Council (1962–1965), Ratzinger served as a peritus or theological consultant to Josef Cardinal Frings of Cologne, Germany, and has continued to defend the council, including Nostra Aetate, the document on respect of other religions, ecumenism and the declaration of the right to religious freedom. (Later, as the Prefect for the Congregation for the Doctrine of the Faith, Ratzinger most clearly spelled out the Catholic Church's position on other religions in the document Dominus Iesus (2000) which also talks about the proper way to engage in ecumenical dialogue.) He was viewed during the time of the Council as a convinced reformer, in fact cooperating with radical Modernist theologians like Hans Küng and Edward Schillebeeckx. Ratzinger himself admitted he was, and partly continues to be, an admirer of Karl Rahner, a well-known academic theologian of the Nouvelle Théologie who was in favour of church reform and who himself proposed new theological ideas. In 1966, Joseph Ratzinger was appointed to a chair in dogmatic theology at the University of Tübingen, where he was a colleague of Hans Küng once again. In his 1968 book Introduction to Christianity, he wrote that the pope has a duty to hear differing voices within the Church before making a decision, and downplayed the centrality of the papacy. He also wrote that the Church of the time was too centralized, rule-bound and overly controlled from Rome. These sentences, however, did not appear in later editions of the book. During this time, he distanced himself from the atmosphere of Tübingen and the Marxist leanings of the student movement of the 1960s, that in Germany quickly radicalised in the years 1967 and 1968, culminating in a series of disturbances and riots in April and May 1968. Ratzinger came increasingly to see these and associated developments (such as decreasing respect for authority among his students, the rise of the German gay rights movement) as related to a departure from traditional Catholic teachings. Increasingly, his views, despite his reformist bent, contrasted with those liberal ideas gaining currency theological circles. During his years at the Second Vatican Council and Tübingen University, professor Joseph Ratzinger publicized articles in the reformist theological journal Concilium, though he increasingly chose less reformist themes than the other contributors to the magazine, Hans Küng as well as the Modernist theologians Edward Schillebeeckx, Marie-Dominique Chenu and Karl Rahner, did. Eventually in 1969, he returned to Bavaria, to the University of Regensburg, a less reformist academical environment. In 1972, he founded the theological journal Communio with Hans Urs von Balthasar, Henri de Lubac, Walter Kasper and others. Communio, now published in seventeen editions (German, English, Spanish and many others), has become a prominent journal of contemporary Catholic theological thought. Until his election as Pope, he remained one of the journal's most prolific contributors. In March 1977, Ratzinger was appointed Archbishop of Munich and Freising. He took as his episcopal motto Cooperatores Veritatis, co-workers of the Truth, from 3 John: 8, a choice he comments upon in his autobiographical work, Milestones. In the consistory of June 1977, he was named a cardinal by Pope Paul VI. By the time of the 2005 Conclave, he was one of only fourteen remaining cardinals appointed by Paul VI, and one of only three of those under the age of 80. Of these only he and Cardinal William Baum took part in the Conclave. On November 25, 1981, Pope John Paul II named Ratzinger Prefect of the Congregation for the Doctrine of the Faith, formerly known as the Holy Office, the historical Inquisition. Consequently, he resigned his post at Munich in early 1982. He was promoted with the College of Cardinals to become to Cardinal Bishop of Velletri-Segni in 1993, was made the College's vice-dean in 1998 and dean in 2002. In office, Ratzinger fulfilled his institutional role, defending and reaffirming official Catholic doctrine, including teaching on topics such as birth control, homosexuality, and inter-religious dialogue. During his period in office, the Congregation for the Doctrine of the Faith took disciplinary measures against some outspoken liberation theologians in Latin America in the 1980s. In the early 1990s Ratzinger suffered a stroke, which slightly impaired his eyesight temporarily. The existence of the stroke was known to the Conclave that elected him pope. In May 2005, the Vatican revealed that he had subsequently suffered another mild stroke - it did not reveal when, other than that it occurred between 2003 and 2005. France's Philippe Cardinal Barbarin further revealed that since the first stroke, Ratzinger has suffered from a heart condition. Because of these health problems, and in order to have time free to write, he had hoped to retire, but had continued at his post in obedience to the wishes of Pope John Paul II. On January 2, 2005, Time magazine quoted unnamed Vatican sources as saying that Ratzinger was a frontrunner to succeed John Paul II should the pope die or become too ill to continue as pope. On the death of John Paul II, the Financial Times gave the odds of Ratzinger becoming pope as 7–1, the lead position, but close to his rivals on the liberal wing of the church. In April 2005, before his election as pope, he was identified as one of the 100 most influential people in the world by Time magazine. Ratzinger himself had repeatedly stated he would like to retire to a Bavarian village and dedicate himself to writing books, but more recently, he told friends he was ready to "accept any charge God placed on him." There can be little doubt that his courageous promotion of orthodox Catholic teaching has earned him the respect of his fellow cardinals throughout the world. He is patently holy, highly intelligent and sees clearly what is at stake. Indeed, for those who blame the decline of Catholic practice in the developed world precisely on the propensity of many European bishops to hide their heads in the sand, a pope who confronts it may be just what is required. Ratzinger is no longer young—he is 78 years old: but Angelo Roncalli, who revolutionized Catholicism by calling the Second Vatican Council was almost the same age (76) when he became pope as John XXIII. As Jeff Israely, the correspondent of Time, was told by a Vatican insider last month, "The Ratzinger solution is definitely on." On April 19, 2005, Cardinal Ratzinger was elected as the successor to Pope John Paul II on the second day of the papal conclave after four ballots. Coincidentally, April 19 is the feast of St. Leo IX, the most important German pope of the Middle Ages, known for instituting major reforms during his pontificate. Before his first appearance at the balcony of Saint Peter's Basilica after becoming pope, he was announced by the Jorge Cardinal Medina Estévez, protodeacon of the College of Cardinals. Cardinal Medina Estévez first addressed the massive crowd as "dear(est) brothers and sisters" in Italian, Spanish, French, German and English — each language receiving cheers from the international crowd — before continuing with the traditional Habemus Papam announcement in Latin. Dear brothers and sisters, after the great Pope John Paul II, the Cardinals have elected me, a simple and humble labourer in the vineyard of the Lord. The fact that the Lord knows how to work and to act even with inadequate instruments comforts me, and above all I entrust myself to your prayers. In the joy of the Risen Lord, let us move forward, confident of his unfailing help. The Lord will help us and Mary, his Most Holy Mother, will be on our side. Thank you. (Official translation taken from www.vatican.va). He then gave the blessing to the people. "Filled with sentiments of awe and thanksgiving, I wish to speak of why I chose the name Benedict. Firstly, I remember Pope Benedict XV, that courageous prophet of peace, who guided the Church through turbulent times of war. In his footsteps I place my ministry in the service of reconciliation and harmony between peoples. Additionally, I recall Saint Benedict of Norcia, co-patron of Europe, whose life evokes the Christian roots of Europe. I ask him to help us all to hold firm to the centrality of Christ in our Christian life: May Christ always take first place in our thoughts and actions!" Some say that Pope Benedict has confounded the expectations of many in the early days of his papacy by his gentle public persona and his promise to listen. It is notable that he has used an open popemobile, saying that he wants to be closer to the people. Benedict's coat of arms has officially omitted the papal tiara, traditionally appearing in the background to designate the Pope's position and replaced it with a simple mitre. However, there have been papal documents since his inauguration that have been appearing with the papal tiara present. Since it is the shield and not the background which is unique to the individual Pope, various backgrounds are possible (though rarely used) for even a single shield. During his inaugural Mass, the previous custom of all the cardinals submitting was replaced by having 12 people, representing cardinals, clergy, religious, a married couple and their child, and newly confirmed people, submit to him. However, all the cardinals had already sworn their obedience upon his election. In a return to tradition, Benedict chose to resurrect the tradition of delegating the celebration of the beatification liturgies.